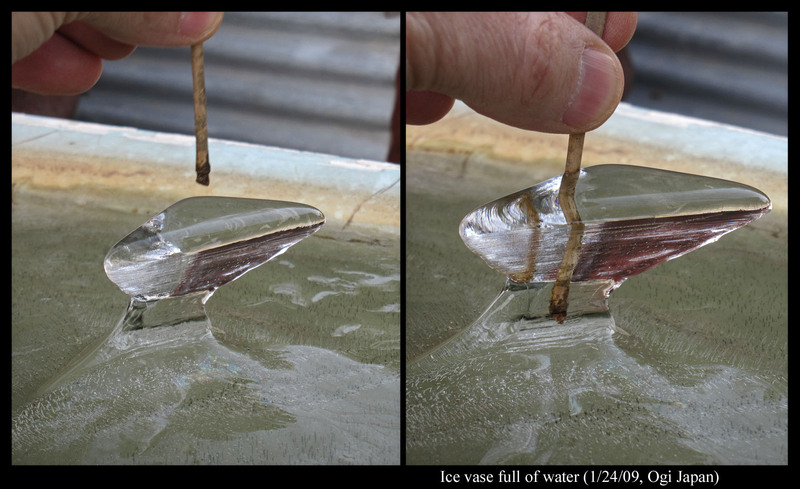 Briefly, ice spikes and vases start when liquid water gets squeezed out of a hole in the ice. The squeezing happens because (1) everywhere except at a small hole, the tub walls and surface ice confine the liquid and (2) some of the water inside freezes to ice. See drawing “A” below. 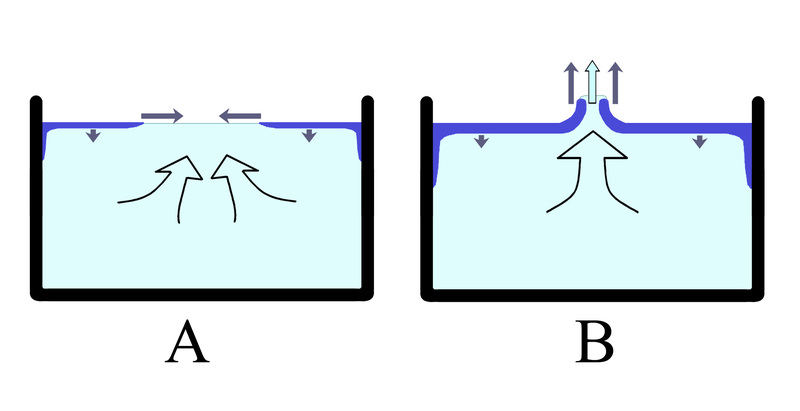 The ice, shown in dark blue, starts from the walls of the tub (though sometimes ice will nucleate away from the wall) and grows both along the surface and into the depths. Ice grows faster along the surface, so I made the gray arrows longer along the surface. But liquid water expands upon freezing to ice, so the resulting mass takes up more space, meaning that the remaining liquid gets pushed away. This liquid must flow through the hole. But most of the time, the water just flows out the hole and spreads across the ice, flooding the surface to some extent, meaning no spike or vase forms (thus the rarity of these forms). However, in rare cases, the rate of freezing very nearly balances the rate that the water level moves up. 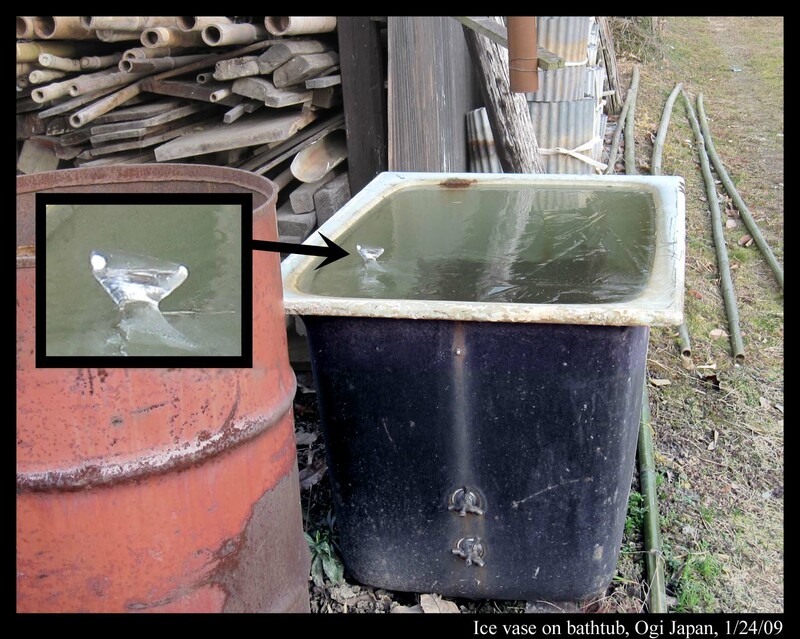 So, as shown in drawing “B” above, the ice follows the outer edge of the water surface at the spout. This balance of rates is not as coincidental as you might think. For example, if the ice were to start growing faster, thus pinching off the spout, then the water exiting the hole, being confined to a narrower opening, would also flow faster – just like the water in a river flows faster in narrow channels. This would tend to produce some flooding, thus widening the spout and opposing the pinching. This may also account for the horizontal ribbing texture you can see in the photographs above. Finally, why does this vase, as well as other vases (see the link listed below), often have a roughly triangular cross section? When the ice first spreads across the surface, it often shoots across in lines that slowly thicken. The direction of these lines are more or less random, and when lines with random directions cross each other, the boundaries are often triangles. See how it worked out in the partly drained puddle below. So the last remaining hole in the surface glaze likely has a triangular perimeter. This explains the triangular cross-section of vases. You might wonder, as I once did, why some puddles, like the one pictured above, drained instead of flooded. But that story will have to wait for another day. Finally, note that unlike the ice protrusions I described in “Ice on the Rocks” (Jan. 27, 2010), which grow from the bottom, these protrusions grow from the top. Nature is rich. then click on the link on the left called “Other people’s ice spikes”. jnelson This entry was posted on February 6th, 2011 at 11:28:00 am by Jon and is filed under Photos, Ice Science, Funny-strange ice, Pond and puddle patterns. Well done, Jon! I found (and extensively photographed, if you want any example) a beautiful ice wall in a Swedish forest puddle. It was about 3cm high, sharp at the top, and about 100cm long, with a tringular cross-section which stood clear at the 1cm thick base from the main frozen surface, indicating water level changes. (Nearby there were many “crunchy puddles” as you call them.) The formation curved around the inside of the puddle to form a large ellipse, and was bafffling until I read your blog on ice vases. The ice wall sounds like a drainage feature, related to the “crunchy puddle” phenomenon (as you mention), and the Jan 27, 2013 entry on puddles. 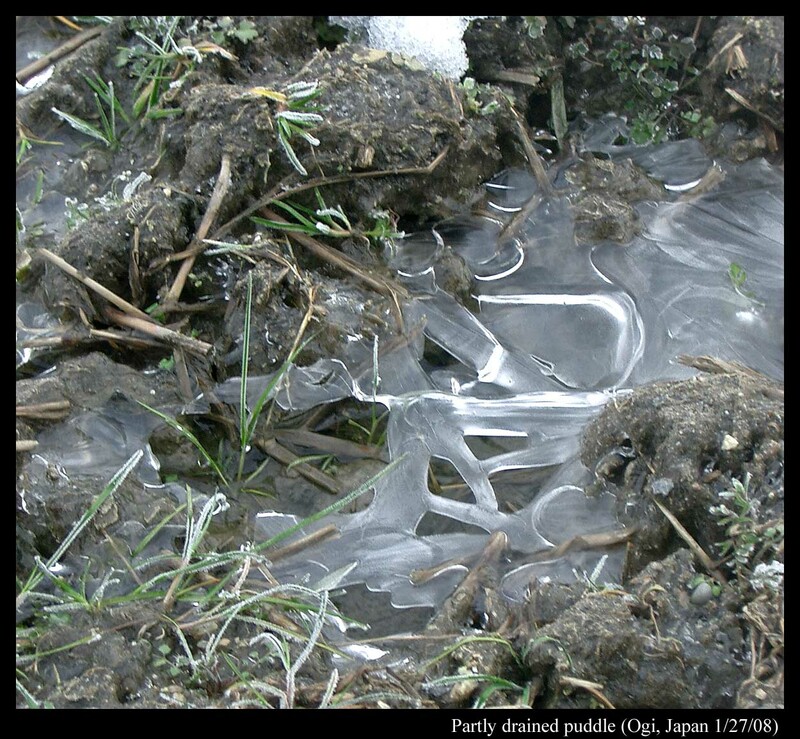 Clearly, there is a lot more to observe and describe about frozen puddles! I’d really like to see a photo of this one you mentioned.